As part of a way to showcase the diverse photography talent of TRU students the university has revealed an exhibition of different photos located in Old Main’s Art Gallery. Two arts professors, Colleen Foucault and Terryl Atkins have given students the opportunity to have their work showcased to the public. Most of the pictures were supplied by first and second year students enrolled in digital arts and design courses as well as communications classes. Undoubtedly the piece that has garnered the most attention is Missing Daughter by Tara-Lynn Wilson. Wilson, a fourth-year psychology student, added that since then multiple individuals have reached out to her to tell her their stories. 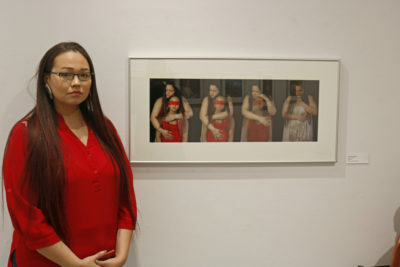 The photograph is a series of four pictures depicting a first nations woman (Wilson’s sister) clutching her daughter in her arms. The third pictures shows her daughter dissolving and then disappearing in the fourth picture while the mother weeps. “It’s supposed to depict the missing and murdered Indigenous women,” Wilson said. The picture is one of two that Wilson has in the exhibit. While Wilson is a psychology student, it is undeniable that her photograph has had quite the reach. Wilson’s boyfriend, Melvin, who is also a photographer is the one who convinced her to leave her comfort zone and try something new. The show concludes Thursday January 24th, so make sure to visit the gallery before it’s over.